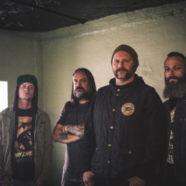 36 CRAZYFISTS will release their deeply personal new albumLanterns on September 29 through Spinefarm Records. It is their second release for the label and the follow up to 2015’s Time and Trauma. The band has shared the first track from the record in the form of “Death Eater,” which saw its premiere over at Loudwire. Listen to the song here. Lanterns is available for pre-order here. 36 Crazyfists will spend August and September on tour. Dates are below.